31 Jan 1942 - 12 Sep 1945 Japanese occupation (renamed Malai Baru). 12 Sep 1945 - 1 Apr 1946 British military administration. 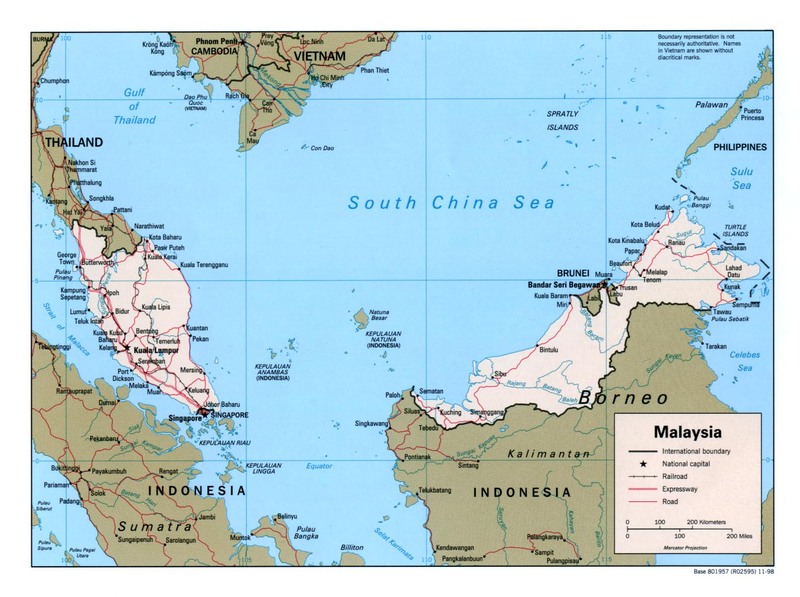 states plus Malacca and Penang). 18 Jun 1948 - 31 Jul 1960 State of emergency declared. 31 Aug 1957 Independence from Britain. 9 Aug 1965 Withdrawal of Singapore. (b) style used in royal proclamation from 16 Sep 1963: Yang di-Pertuan Agong ("Paramount Ruler") which is normally extended to Dengan kurnia Allah, Yang di-Pertuan Agong bagi negeri-negeri dan wilayah-wilayah Malaysia ("By the grace of God, Paramount Ruler of the States and Territories of Malaysia"). 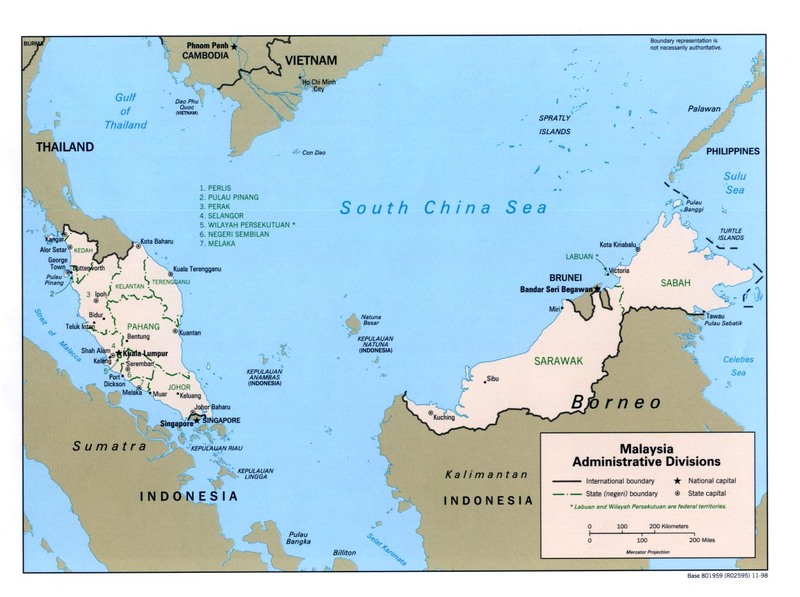 Territorial Disputes: While the 2002 "Declaration on the Conduct of Parties in the South China Sea" has eased tensions over the Spratly Islands, it is not the legally binding "code of conduct" sought by some parties; Malaysia was not party to the Mar 2005 joint accord among the national oil companies of China, the Philippines, and Vietnam on conducting marine seismic activities in the Spratly Islands; disputes continue over deliveries of fresh water to Singapore, Singapore's land reclamation, bridge construction, and maritime boundaries in the Johor and Singapore Straits; in 2008, ICJ awarded sovereignty of Pedra Branca (Pulau Batu Puteh/Horsburgh Island) to Singapore, and Middle Rocks to Malaysia, but did not rule on maritime regimes, boundaries, or disposition of South Ledge; land and maritime negotiations with Indonesia are ongoing, and disputed areas include the controversial Tanjung Datu and Camar Wulan border area in Borneo and the maritime boundary in the Ambalat oil block in the Celebes Sea; separatist violence in Thailand's predominantly Muslim southern provinces prompts measures to close and monitor border with Malaysia to stem terrorist activities; Philippines retains a dormant claim to Malaysia's Sabah State in northern Borneo; per Letters of Exchange signed in 2009, Malaysia in 2010 ceded two hydrocarbon concession blocks to Brunei in exchange for Brunei's sultan dropping claims to the Limbang corridor, which divides Brunei; piracy remains a problem in the Malacca Strait.